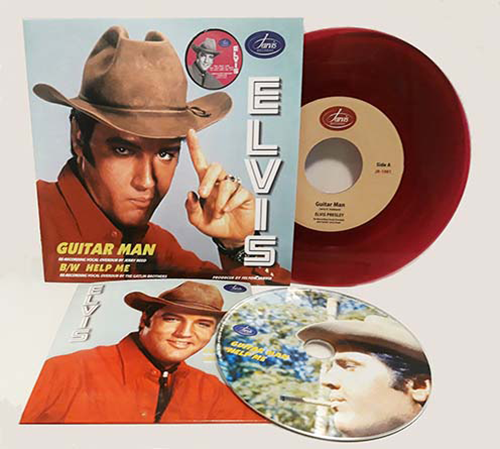 In 1980 Felton Jarvis, Elvis' record producer for the last decade came to the remarkable idea to freshen up some of Elvis' recordings. The idea was to add total new backing tracks to Elvis' voice. This resulted in the 1981 record release of "Guitar Man". You hate it or you love it is probably the right thing to say about the album. Felton was convinced Elvis would have loved it. The title track "Guitar Man" written and first performed by Jerry Reed was one of the tracks considered for the album. Jerry Reed was part of the original recording by Elvis in 1967 and now Jerry Reed was back in the studio with Felton Jarvis to work on the new album. Besides the guitar work he also recorded a "duet" version of the song. This version never made it to the album but it probably should have. Felton finished the track most likely for his own pleasure or maybe it was considered to end up on the album. We probably will never know as Felton Jarvis sadly passed away early January 1981 even before the album came out. The second track on this 45RPM / CD combo is "HELP ME". The song written by Larry Gatlin of Larry Gatlin and the Gatlin Brothers. This track was not used on the GUITAR MAN album. This track has overdubs by the Gatlin Brothers and when you listen to it you will notice this version was probably not finished by Felton Jarvis, this is either an "early version" or he never go to the point of finishing it due to his untimely death. Before the album would be released the idea raised to record a so called open-ended interview with Felton Jarvis for the radio stations. Disk Jockeys would be able to ask a question and Felton would answer the question that would be played from a record. The recording for this open-ended interview would take place somewhere in the last week of December. On December 16 1980 Jerry Flowers visited Felton to discuss the questions and prepare the interview. Jerry Flowers recorded this meeting as a test for the upcoming interview. The official interview never took place as Felton Jarvis suffered a stroke on December 19. Resulting in his death January 3rd 1981. RCA decided to release the informal recording on a record for Radio Stations. This complete recording is now available on this cd. This 45RPM plus CD is available in yellow & purple vinyl.